Some garden sheds are lined with tools. Some garden sheds are overflowing with bags of soil and terracotta pots. 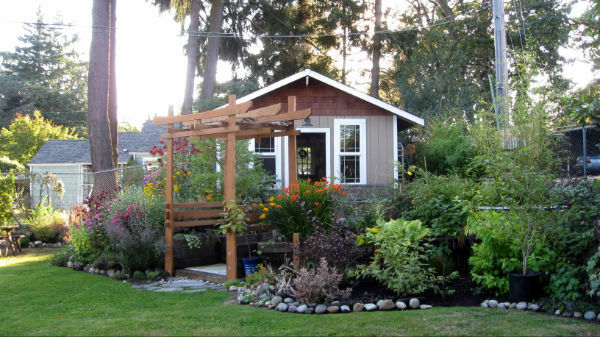 Some garden sheds are catchalls for lawn mowers and barbecues. 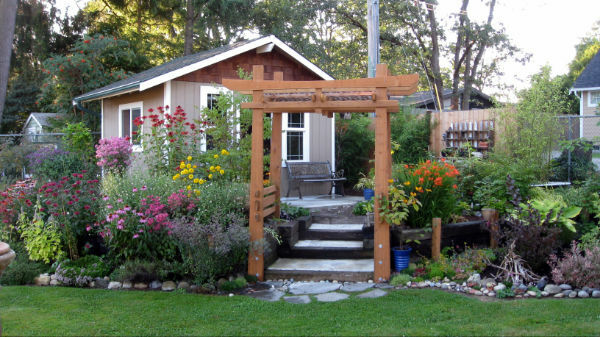 And then there is Deb Alder’s garden shed, best described as a home away from home fashioned with an artist’s eye and a large dose of imagination. Deb designed the shed. A team of friends and relatives, including husband, Jeff and son, Madison put it together over the course of two years. The shed is a roomy 12’x14’ mini-house complete with comfy chair, heat and even cable. It’s “Deb’s World”. With the exception of some siding, a few shingles and one window, everything in and out of the shed is made from repurposed or recycled materials. The front door is from a second hand store in Yelm. The potting bench was used for 20 years at a local nursery. What began as a regular gardening shed has evolved into a mini cottage with all the charm of a playhouse. It sits on a small terraced and densely landscaped 4-foot “hill” in a small neighborhood backyard complete with arched entrance. Deb calls the path that leads to the little hill her “rock welcome mat”. The original intention was simple, the shed should house everything except a lawn mower…and from there it took on a life of its own. A wooden retaining wall creates an upper terraced garden on three sides of the house. A lower, one rock high, wall was built from “Washington potatoes”, rocks collected from areas cleared to build the shed. 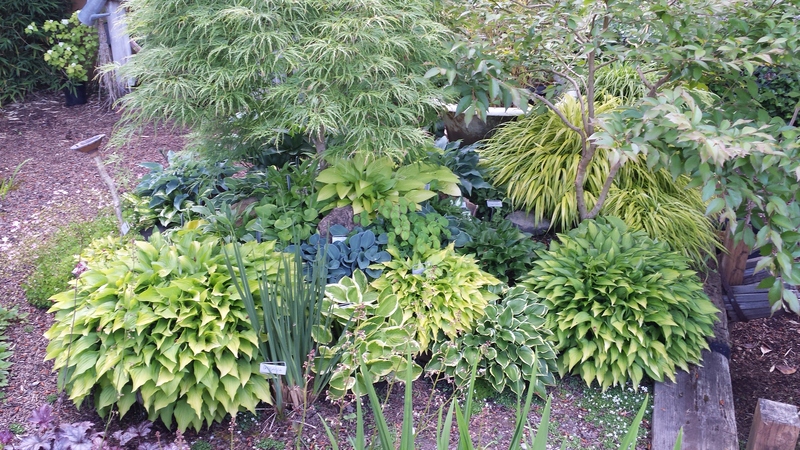 The small-scale landscape around the shed includes a collection of miniature hostas with names like Hosta ‘Itty Bitty’, H.Tiny Tears and H. Pandora’s Box with another collection of sedums and sempervivums spread just below the wood wall. Deb planted more than 200 perennials in the rest of the upper and lower terraces, 200 “different” perennials. Three of each is the rule but with that designer/nurseryman’s rule you forgo variety. Such a small-scale landscape lends itself to the “one of each” method. Mixed in with the perennials are a few well-placed shrubs, bulbs, annuals and pretty volunteers like “Johnny Jump-ups” and Cerinthe. The effect is a year round explosion of color in flower and form. This year Deb is trying out Tagro, Tacoma’s magic elixir compost. So far, the plant areas covered with Tagro have not been devoured by slugs or destroyed by squirrels. Coincidence? The shed sits above the terraces and is complete with an old bench on the ample front porch, a perfect perch to sit and survey the little, jam-packed landscape. The side of the shed is “screened in” with tall bamboo. No, not THAT bamboo. This bamboo is “Green Panda”, a non-invasive clumping bamboo that screens but doesn’t run. 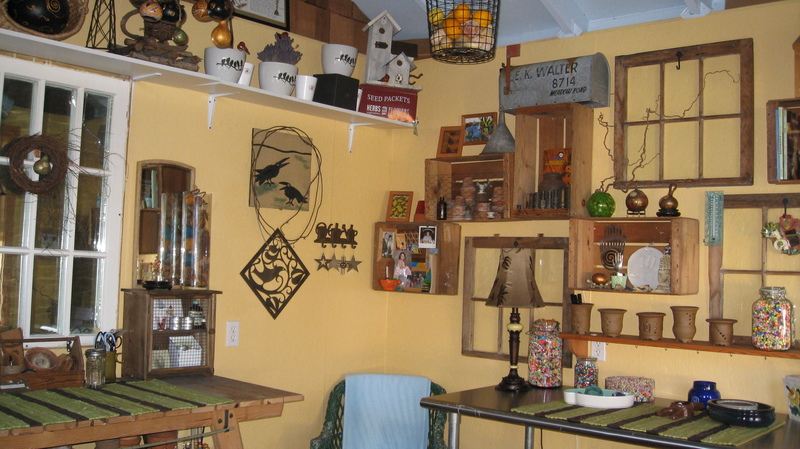 And then, there is the inside of the garden shed… It’s “Deb’s World”. Above the door hangs a carousel horse! The floor is covered with a vintage well-worn Oriental carpet used for 23 years in the retired garden shop where Deb volunteered. The shelves are made from bulb and fruit crates from the same shop. The artwork displayed in the crates and on the walls (yes, plenty of artwork) is either something Deb made herself, or art purchased from South Sound farmer’s markets and local artists, including a favorite crow tile from tilest Claudia Reidner from Ixia Tile Tacoma. Pots with blackbirds, a birdhouse by a local craftsman and a British tin for seeds complete that corner. Each wall mounted bulb and fruit crate has its own theme. One is filled with a collection of brass nozzles, one has small replicas of hands and one crate has a dial from an old telephone, the brass bells (the ringer) that were inside the old phone and a large light bulb with a kinetic spinner inside that takes off when the light hits. With Deb’s eye for detail, odds and ends are turned into little pieces of art. Her prized possession is a rice container that her mom purchased from a man who sold his wares door to door to the local Japanese community. It’s one of those items that we all have in our lives…monetarily worth very little but never replaceable. A reading corner near a window has ready access to garden books. A $2 chair from Goodwill fits in perfectly. An opposite wall has bits and pieces of old garden tools displayed on a “rediscovered” red door found when they tore apart an old garage to make way for the shed. 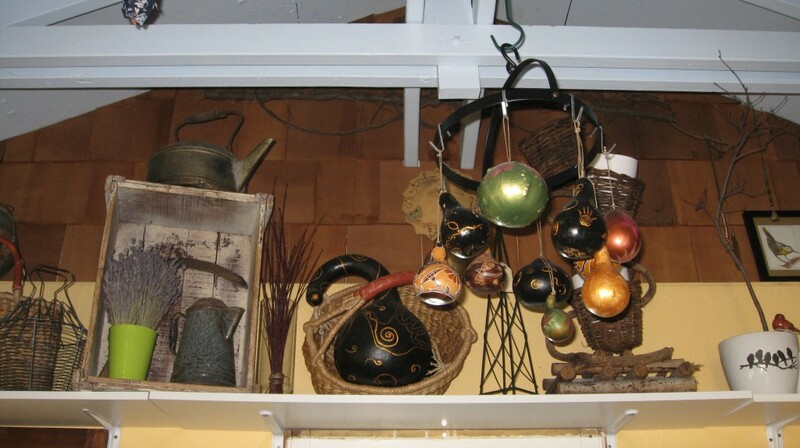 One side of the shed is devoted to Deb’s other passion, her clever crafting. Right now she is making jewelry from repurposed spoons and beads she has collected over the years. Her current crafting “favorite thing” is a proudly displayed dremel kit. Beads and thousands of “lucky stars” (tiny origami) fill up vases, bowls and jars throughout the shed. Every corner has a theme and every item tells a story. One look at it isn’t nearly enough. It’s “Deb’s World”. Anyone who visits comes away a little happier and a little inspired.